This chemise is made of a soft white cotton blend and sports extra long sleeves, adjustable by a drawstring and tying them at the shoulder. Hand wash only. This medieval fully cut overdress with a lace-up back is made of poly cotton. Decorated with golden patterns and fleur de lis designs. Dry clean. This undergarment is made of muslin. Fully adjustable in the neck and sleeve area with drawstrings. The short sleeves have ruffles and bows. This overdress is made of rich purple cotton velvet has convenient belt loops to keep the included belt in place. Features a full lace up back with modesty panel. Comes with a matching cotton velvet and ribbon head circlet. This blue gown is made of velvet and has a lace back which secures with a silver cord. Made in 2 pieces attached with a button flap. Choker included. This high-laced collar Victorian shirt is made of cotton. Features a pleated and laced front bib design, a fine black ribbon around the neck, and a pair of buttons at the rear of the collar. This sash is made of velvet with satin ribbon and has a matching satin tie in the back. Features dip in the front of the belt. 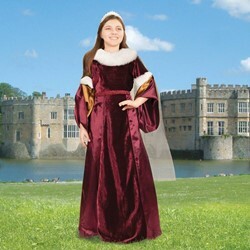 This gown is made in a rich wine colored velvet cotton with satin lining. Features faux white fur trims at the collar and sleeves and black cape netting with silver flecks. Full lace up back with modesty panel. Comes with a matching braided red cord belt.